Rent or purchase Concrete Forms – Corners by Steel-Ply from the Duke Company in Rochester NY, Ithaca NY and Western New York. 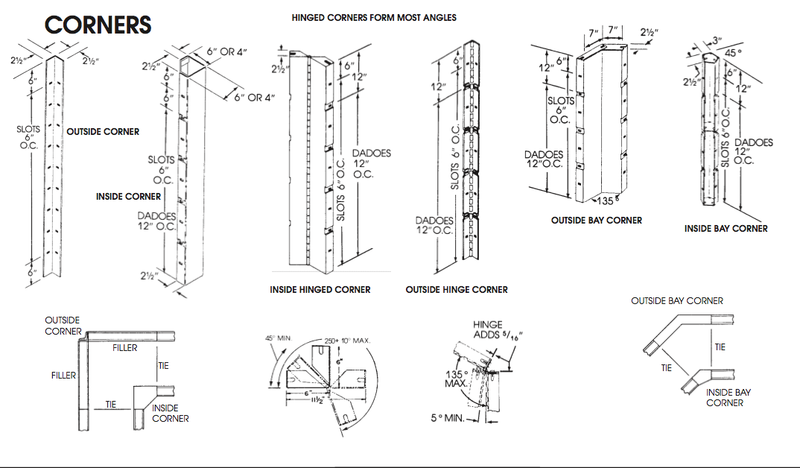 Corners: Inside & Outside – – enable locking of adjoining forms to create a 90 degree angle. The facing dimension is either 4 foot x 4 foot or 6 foot by 6 foot. Reinforcing straps ensure quality and stability. Bay Corners: enable forming of 135 degree angle. The facing dimension of the inside bay corner is 3 foot x 3 foot, and the facing dimension of the outside bay corner is 7 foot x 7 foot. Notably, bay corners can also be implemented on the horizontal dimension to form wall haunches and walls known as ‘Y’ walls. Hinged Corners: essential to forming inside corders to a 45 degree angle. Outside Hinged corers are essential to forming outside corders from angles including 135 degrees to 5 degrees. Important safety precaution: please note, read and comply with all safety warnings. Notably, it is essential that corners be adequately “waled, braced and blocked as required”.